Does the world really need another diet book? According to The Australian Institute of Health and Welfare, rates of overweight and obesity are continuing to rise in Australia, with almost 2 in every 3 adults fitting into the overweight or obese category. I’m sure there’s a similar picture in other parts of the western world. The proliferation of information that has swept the internet and bookstores everywhere hasn’t actually helped the situation. This is probably because so much of the information is conflicting and confusing, with much of it ineffective or even downright dangerous. The advice provided by Dr Joanna McMillan in Get Lean, Stay Lean is neither faddish nor confusing. It’s commonsense and you probably already know it. Eat more vegetables. Exercise. Keep stress to a minimum. That’s the crux of it (and probably the crux of most reputable books on health and nutrition), but McMillan has presented this information that everybody knows and few people do in a way that makes it very easy to incorporate into day-to-day living. 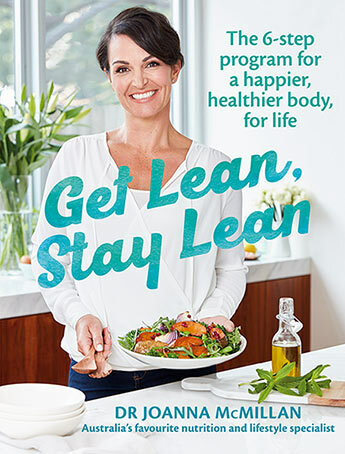 Despite the title, Get Lean, Stay Lean really isn’t about weight loss. It’s about developing healthy, sustainable habits. One of the most clever mnemonics is the Dr Joanna plate. This may seem simple but it’s really an ingenious way of visualising that can be used in any situation to ensure that you’re eating a balanced, optimised meal. The framework is easy to memorise because of the way it is laid out, in pie sections on a dinner plate, and is useful in any situation, including meals out. It doesn’t involve measurement, counting calories or any expense. It’s just a way of making better choices via a flexible, memorable framework. Another of the tools the book provides is the six steps. These are really steps to live by, not just eat by, and consist of optimising food, drink, exercise, activity, minimising stress and getting enough sleep. Again, this all may seem self-evident—you probably won’t be shocked by McMillan’s advice to aim for an average of eight hours sleep a night, stay hydrated or get regular daily exercise. The information, however, is presented in a holistic way with lots of information on how to make sure these things happen regularly. While most of it might be familiar, McMillan’s deep understanding of the psychological factors behind weight struggles from many years running a nutritional clinic is obvious as she provides information designed to empower readers to take responsibility for their choices. There’s no dieting here. But miss one of the steps on a regular basis, and your chance of looking and feeling your best are greatly diminished. What might come as a surprise is how a lack of sleep can sabotage weight-loss. Or how exercise can influence a lot more than muscle definition. McMillan also looks at eating trends like Paleo, low carb diets, low sugar diets, intermittent fasting, and the Mediterranean diet and explores the nutritional science behind these and why some do and don’t work over the long term. The second part of the book consists of healthy recipes. As with the rest of the information in the book, the recipes are designed for home cooks and are super-easy and generally quick to make. Each recipe contains the full suite of nutritional information, notes and tips. Being a breakfast gal, this is my favourite section and I have expanded my breakfast repertoire to include some of McMillan’s recipes, such as chia oats with stewed apple and prunes, Bircher muesli with apple and blueberries, and poached eggs on spiced sweet potato cakes (also a very nice lunch). There are a wide range of snacks, salads, soups, seafood (the Nori-crusted salmon is delicious), meat, poultry, vegetarian dishes (the Baked falafels with tzatziki dip is much healthier than deep frying and tastes even better), sweet treats (so far my favourite is the Choc orange almond bliss balls), and drinks like smoothies. None of the recipes is a diet recipe. They’re all about eating healthily and because they’re simple to make and use readily available ingredients, they are also easily adapted and mostly child-friendly. While it’s true that you probably don’t need another diet book in your life, Get Lean, Stay Lean is not a diet book. It’s more a book about creating a healthier, happier life through long term good habits.